Welcome to the latest instalment in the 9mm series! I'm very grateful to all the terrific crime writers who've generously given their time over the past few years. You can see the full index of author interviews here. If you've got a favourite author who hasn't yet featured, leave a comment, and I'll make it happen. Today, I'm very pleased to welcome thriller author Mason Cross to Crime Watch. Cross is a Scottish author who, like his protagonist Carter Blake, operates under an assumed name. Carter Blake is a highly skilled operative who specialises in finding people who don't want to be found; Mason Cross pens high-octane thrillers that have been praised by the likes of thriller masters Lee Child, Simon Kernick, and Lisa Gardner. His debut, The Killing Season, was longlisted for the prestigious Theakston Old Peculier Crime Novel of the Year Award, while his sophomore effort, The Samaritan, was a Richard and Judy Book Club pick. Part of an exciting new generation of thriller writers, Cross is published on both sides of the Atlantic, and there are now four books in his Carter Blake series (the fourth, Don't Look for Me, is already out in the UK, but will be published in the United States in the coming months. 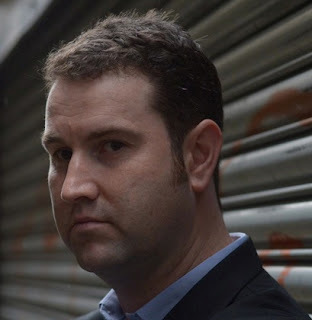 For those on the festival circuit, this weekend Mason Cross will be appearing in two events at the Bute Noir festival in Scotland, alongside Steve Cavanagh on Friday night, and with Steph Broadribb on Sunday afternoon (all three are British authors who set their books in the USA). If you can't make it to Bute, in September you can see Cross at Bloody Scotland in Stirling, including as part of the 'From Tinseltown to Sin City' panel with Chris Carter that I will be moderating. 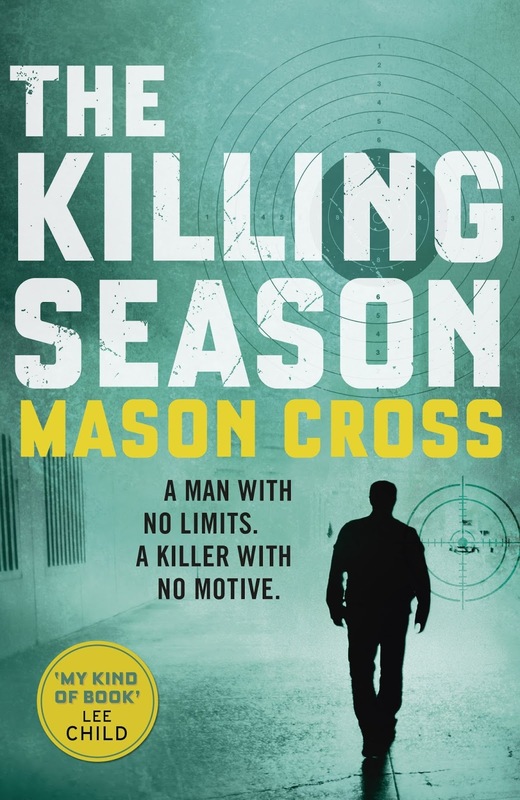 But for now, Mason Cross becomes the 167th crime writer to stare down the barrel of 9mm. That’s a tough one, because I have so many favourites, including Harry Bosch, Jack Reacher, Travis McGee, Tempe Brennan, John Rebus and more. If I had to pick one, it would probably be the classic: Philip Marlowe. So much of the template for the maverick hero who always does the right thing was laid down by Raymond Chandler in those books. He’s a compelling character, but his smartass attitude and ability to find poetry in the most unpromising of places make him a great character (though not always a completely likeable one) to spend time with. I remember loving the Three Investigators book The Secret of the Vanishing Treasure when I read it in primary school. It’s probably what kindled a love of mystery books, and I read all of the other books in the series I could get hold of. Before your debut crime novel, what else had you written (if anything)? Unpublished manuscripts, short stories, articles? I had a short story called ‘A Living’ published in the Sun Book of Short Stories, after entering it for a competition. I got a kick out of going into bookshops and libraries and seeing my name in a real book, and I think that definitely spurred me on to keep writing. I had a few other stories published in small magazines. Probably the biggest piece of work I completed before writing a novel was my final year dissertation at university, which was on four Stephen King books and the movies adapted from them. I’m told that tutors at Stirling University cite that as evidence you can write your dissertation on anything, which is either a compliment or a criticism, I’ve never been sure. Oh, and I had one unpublished novel before The Killing Season. Looking back, it was for the best that it didn’t find a publisher, because it allowed me to avoid a lot of the rookie mistakes for the next one. Unfortunately, between writing a book a year, having a day job and being dad to three kids I don’t have a whole lot of time to indulge my other interests. I used to love playing basketball and cycling, but at the moment climbing three flights of stairs just about kills me. I also love walking, both long distance trails like the West Highland Way, and just wandering around a big city like New York or London. I still try to explore a new place whenever I travel. What is one thing that visitors to your hometown should do, that isn’t in the tourist brochures, or perhaps they wouldn’t initially consider? Glasgow is a great town because it’s big enough that you have all the social and entertainment advantages of city life, but its location means you can get in the car and be surrounded by mountains and lochs and complete solitude in less than an hour. In terms of off-the-tourist-trail stuff, I’ve always liked exploring the hidden parts of the city. You can go on a guided tour of the caverns underneath Central Station where they have abandoned Victorian platforms, and you find out all sorts of cool stuff, like fact they buried an entire village during construction, or where they stockpiled the dead coming back from World War I. If I was a horror writer, there would be a lot of material for a book there. The other great way to get a feel for the city is doing the Subway pub crawl, getting off at each of the fifteen stops which span some of the most deprived and most affluent parts of the city. It would be an exceptionally boring movie. One of my American friends keeps telling me Liev Schreiber should play me, but I think that’s just because we both have moderately chubby cheeks. I like all of them once I have enough distance from the writing process (you absolutely hate a book by the time it gets to proof stage), but I’d probably have to say the first one, The Killing Season. Maybe that’s just because it’s longer since I wrote it, but I enjoyed having all the time in the world to finish it, as opposed to the subsequent books where I’ve had deadlines to hit. I was pretty happy about it. I found out when my agent called me on a Friday night half an hour before I had to leave the house for my second job delivering pizzas. So the immediate celebration was eating dinner and going to work, but I picked up a few beers after my shift to celebrate. I think I’m too new to have experience anything truly bizarre yet, but there was one guy at a library event who asked a long, rambling question about why you need to go to Eton to be an actor or a musician or get a book published. He was pretty upset about it. I didn’t go to Eton. You can read more about Mason Cross and his tales at his website, and follow him on Twitter.